Despite two council decisions, one public inquiry and the best efforts of several thousand local residents over two years, Tesco are opening on Mill Road tomorrow, 26th August 2009. We expect that a judicial review of the situation will happen later – hopefully very soon – but in the meantime, a judge has decided not to stop Tesco opening for now. With that in mind, we would like to say what we think this does, and doesn’t, mean, and what we want to do next. The fact that very few local residents seem to want them while thousands want them to stay away; that they already own 13 stores in our small city, and are already trying to open yet another, on East Road; that their delivery operations have been judged to be dangerous by all competent authorities that have looked at them (and by Tesco themselves); that they would be more expensive and offer less choice than the existing shops; that they have been refused applications for the site again and again – none of this has been enough to stop them opening. We think that any system where this can happen is a system that is deeply flawed and needs fixing. We think that local residents should have a meaningful voice in what happens to their community, so that when a dangerous and unpopular scheme like this appears, the community can take action to stop it. But we also think that however unhappy we may be about Tesco opening, that the community has won far more than Tesco from this fight, and we won from the moment that the first person signed the petition, or put a poster up in their window, or went to a campaign meeting. Whatever happens in the future, Tesco will never get back the more than £4.6 million in lost turnover that we estimate the delay in opening has cost them. They will always have been humiliated at two council meetings, a public inquiry and an alcohol license hearing. The delay meant, too, that they have had to open after Mill Road became a cumulative impact zone, meaning that they did not get an alcohol license. The efforts of the local community to highlight the dangers of deliveries and the noise and nuisance of their plans also meant that they had to open a much smaller store than they wanted, and one that is more expensive to operate. All this means that the local community has managed to permanently restrict the damage that this store can do to the area. In contrast, the community has gained more than any of us could ever have imagined when the campaign started, almost two years ago. Many of us know our neighbours better, use our local shops more, and have learned to do things that we never thought we could do. The campaign has shown that thousands of people of every political viewpoint, age, religious view, and background can put aside the things that divide them and stand up together for something that unites them. The mural on the Mill Road bridge says “respect and diversity in our community”. We think this campaign has proved that this is exactly what the Mill Road community is like. 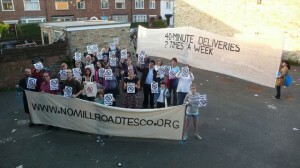 We always knew that Mill Road was a special place; that’s why we’ve all fought so hard to protect it. The two years of that fight have shown us how right we were. So, even if Tesco are eventually allowed to stay open on Mill Road, we think that the community is much stronger and Tesco is weaker as a result of what has happened here. So what happens next? Well, that depends on the outcome of the legal process, but in any case there are two things we would like to ask you to do if you have supported the campaign. These reflect the two concerns that have come up again and again over the last two years – the threat to road safety and the threat to local shops. We are asking everyone to keep an eye on Tesco’s deliveries. They are not allowed to stop lorries (their own or their suppliers’) on the street – either on Mill Road or Sedgwick Street. They have to respect the one way system. If they don’t, or if they stop on the street, let us know and let planning enforcement and the police know. Secondly, and just as importantly, the best way that you can show your continued opposition to Tesco is to support your local independent shops. It’s likely that most of us will never want buy anything from this store, but more important than a boycott of a dull, overpriced chain store is a commitment to actively support the diverse and independent shops that Tesco threatens. 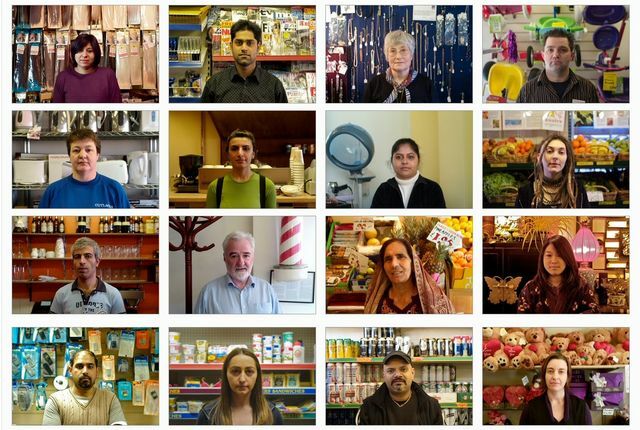 Tesco will only hurt these businesses if we let it; so we’re asking all supporters to buy something from an independent business on Mill Road tomorrow. And to do the same the next day. And the day after that. Using our local shops is the way to keep them alive. We will let you know as soon as we have any news about the legal action, but until then these are things that we can do, starting tomorrow, to help our community. PS There will not be a protest at the opening of the store.